Mol. Cells. Mar 31, 2018; 41(3): 244-255. Low-grade pro-inflammatory state and leptin resistance are important underlying mechanisms that contribute to obesity-associated hypertension. We tested the hypothesis that Astragaloside IV (As IV), known to counteract obesity and hypertension, could prevent obesity-associated hypertension by inhibiting pro-inflammatory reaction and leptin resistance. High-fat diet (HFD) induced obese rats were randomly assigned to three groups: the HFD control group (HF con group), As IV group, and the As IV + α-bungaratoxin (α-BGT) group (As IV+α-BGT group). As IV (20 mg·Kg−1·d−1) was administrated to rats for 6 weeks via daily oral gavage. Body weight and blood pressure were continuously measured, and NE levels in the plasma and renal cortex was evaluated to reflect the sympathetic activity. The expressions of leptin receptor (LepRb) mRNA, phosphorylated signal transducer and activator of transcription-3 (p-STAT3), phosphorylated phosphatidylinositol 3-kinase (p-PI3K), suppressor of cytokine signaling 3 (SOCS3) mRNA, and protein-tyrosine phosphatase 1B (PTP1B) mRNA, pro-opiomelanocortin (POMC) mRNA and neuropeptide Y (NPY) mRNA were measured by Western blot or qRT-PCR to evaluate the hypothalamic leptin sensitivity. Additionally, we measured the protein or mRNA levels of α7nAChR, inhibitor of nuclear factor κB kinase subunit β/ nuclear factor κB (IKKβ/NF-KB) and pro-inflammatory cytokines (IL-1β and TNF-α) in hypothalamus and adipose tissue to reflect the anti-inflammatory effects of As IV through upregulating expression of α7nAChR. We found that As IV prevented body weight gain and adipose accumulation, and also improved metabolic disorders in HFD rats. Furthermore, As IV decreased BP and HR, as well as NE levels in blood and renal tissue. In the hypothalamus, As IV alleviated leptin resistance as evidenced by the increased p-STAT3, LepRb mRNA and POMC mRNA, and decreased p-PI3K, SOCS3 mRNA, and PTP1B mRNA. The effects of As IV on leptin sensitivity were related in part to the up-regulated α7nAchR and suppressed IKKβ/NF-KB signaling and pro-inflammatory cytokines in the hypothalamus and adipose tissue, since co-administration of α7nAChR selective antagonist α-BGT could weaken the improved effect of As IV on central leptin resistance. Our study suggested that As IV could efficiently prevent obesity-associated hypertension through inhibiting inflammatory reaction and improving leptin resistance; furthermore, these effects of As IV was partly related to the increased α7nAchR expression. Excess weight gain and visceral adipose deposition are closely related to the increased prevalence of hypertension, which perhaps accounts for 65–75% of the risk of human essential hypertension (Hall et al., 2015). Although weight loss is generally recommended as the first guideline for treating obesity-associated hypertension, evidence indicates that obese patients are unable to sustain sufficient long-term weight loss, and there are few available weight-loss drugs that can safely produce adequate long-term weight loss (Mark, 2008). Within this context, the current therapeutic approaches focus directly on anti-hypertensive therapy. Unfortunately, obesity-associated hypertension is often resistant to several classes of anti-hypertensive drugs (Chobanian, 2009). Furthermore, despite the use of β-blockers to treat hypertension through the inhibition of sympathetic excitation, metabolic complications caused by β-blockers cannot be ignored (Jordan et al., 2005). Against this background, a novel drug is needed to better manage obesity-associated hypertension. Several lines of inquiry have suggested that excessive nutrients presented in the hypothalamus cause metabolic syndrome-related hypothalamic inflammation (Cai and Liu, 2011). At the onset of obesity, hypothalamic inflammation (as a causal factor) precedes the onset of overt obesity and occurs much earlier than inflammation, or metabolic disorders in peripheral tissues (Valdearcos et al., 2015). With the development of obesity, pro-inflammatory cytokines produced in the peripheral tissue can feed back to the brain, which reinforce and maintain the hypothalamic inflammation (Winklewski et al., 2015). Chronic inflammatory reaction mediated by IKKβ/NF-KB pathway in the mediobasal hypothalamus, the exact primary brain site of sensing nutrition and regulating metabolism, is a primary pathogenic link between obesity and hypertension (Purkayastha et al., 2011). The active IKKβ/NF-KB signaling and increased pro-inflammatory cytokines in the hypothalamus up-regulate expression of the suppressor of cytokine signaling 3 (SOCS3) and protein-tyrosine phosphatase 1B (PTP1B). As the negative regulators of leptin signaling, both SOCS3 and PTP1B induce central leptin resistance by disrupting the phosphorylation of the janus kinase 2/signal transducer and activator of transcription 3 (JAK2/STAT3) (de Git and Adan, 2015; Mark, 2013; Wang et al., 2012). In this condition, leptin fails to effectively regulate energy homeostasis, while maintaining its effects on stimulating the cardiovascular/renal sympathetic nerve system (SNS), leading to sympathetically mediated hypertension (Mark, 2013). Conversely, inhibiting the IKKβ/NF-KB pathway within the mediobasal hypothalamus improves leptin resistance, and prevents the occurrence of obesity and hypertension in the face of dietary challenge (Purkayastha et al., 2011; Zhang et al., 2008). Therefore, hypothalamic leptin resistance is mainly attributed to the direct action of hypothalamic inflammation and indirect action of peripheral inflammation. Restoring hypothalamic leptin signaling sensitivity by suppressing the central and peripheral inflammation reaction holds two converging benefits in combating both obesity and obesity-associated hypertension. Over the past decade, an intriguing phenomenon has been found where chronic smokers had lower body weights than non-smokers (Filozof et al., 2004; Martinez de Morentin et al., 2012). Furthermore, this study revealed that chronic cigarette smoking seemed to decrease blood pressure (BP) (Hughes et al., 1993). These interesting results may be partly attributed to nicotine, the main component of cigarettes (Hur et al., 2010). Recently, studies performed by Tracey (2009) have shown that nicotine suppresses the activation of the IKKβ/NF-KB signaling transduction pathway, and thereby reduces the production of pro-inflammatory cytokines by binding to the α7 nicotinic acetylcholine receptor (α7nAChR) in immune cells; later named as the cholinergic anti-inflammatory pathway. In the hypothalamic neurons and peripheral adipose tissue, abundant α7nAChR have been found (Huang et al., 2011). Moreover, studies have demonstrated that nicotine-induced α7nAChR activation significantly alleviates peripheral inflammation via blocking the IKKβ/NF-KB pathway, contributing to the improved leptin resistance and metabolic dysfunction in obese rats (Wang et al., 2011). Nevertheless, due to the adverse effects of nicotine, it is not a suitable drug to use to alleviate metabolic inflammation; therefore, other alternatives to activate α7nAChR should be exploited. Astragali Radix has been used to treat degenerative diseases in central neural system such as ischemia-induced brain damage in China for thousands of years. Currently, it is believed to have health-promoting properties and is frequently used as a fluid supply in coffee, tea substitutes and food in places such as Europe, the Middle East, Asia and USA (Movafeghi et al., 2010). Astragaloside IV (As IV), one of the major bioactive compounds extracted from Astragali Radix, has been indicated to pass through the blood-brain barrier and be detected in brain parenchyma (Chen, 2006; Wu et al., 2016). Studies have discovered that peripheral adminstration of As IV exerts an anti-inflammatory effect through strongly inhibiting the production of proinflammatory cytokines and activation of IKKβ/NF-KB pathway in central neural system (Li et al., 2012; Sun et al., 2016). 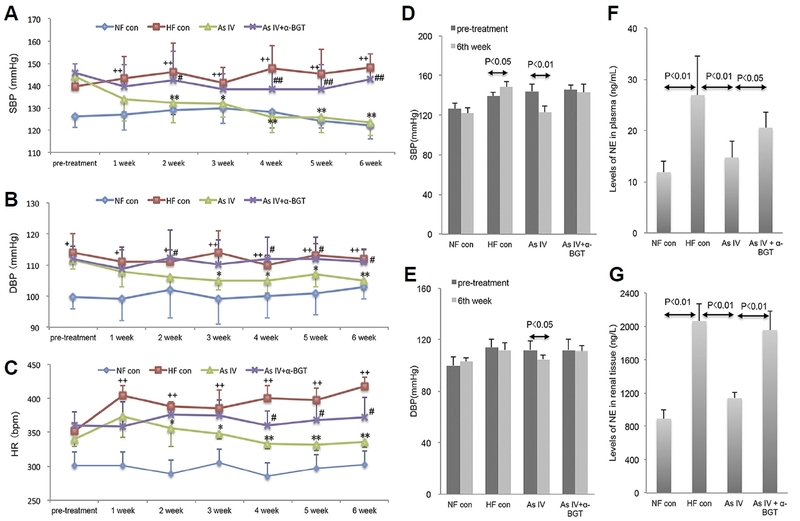 Furthermore, recent studies have found that As IV improved metabolic disorders through enhancing hypothalamic leptin sensitivity in obese rats (Wu et al., 2016), and prevent hypertension by protecting endothelium-dependent vaso-relaxation through the nitric oxide-cGMP-related pathway in fructose-fed rats (Zhang et al., 2011). However, little is known about this compound in the improvement of hypertension in obesity. In our study, we hypothesized that As IV could prevent the development of hypertension in high-fat diet (HFD)-induced obesity by improving inflammatory reaction and leptin resistance, which is partly related to the upregulated α7nAChR expression (Fig. 1). Our results indicate the potential application of As IV as a new pharmacological agent in the prevention of obesity-associated hypertension. Male Wistar rats (8 weeks old, average body weight of 250 ± 20 g) were purchased from Shandong Lukang Animal Center (Certification: SCXK Lu 20130001). All animals were housed in a temperature-controlled room (22 ± 2°C) with a 12:12 h light-dark cycle, and allowed free access to food and water ad libitum. After the adaptation week, animals were distributed into the normal fat diet group (NF con group, 7 rats) and the high-fat diet (25 rats). The normal fat food contained protein (20.25%), fat (7.25%), and carbohydrate (62%), and the high-fat food was composed of protein (22%), fat (27%), and carbohydrate (41%). After 16 weeks of a high-fat diet, rats with a 25% higher body weight than rats in the NF control group were considered as obese. These obese rats were then randomly assigned to three groups: the HFD control group (HF con group), As IV group, and the As IV + α-bungaratoxin (α-BGT) group (As IV+α-BGT group). Both the As IV group and As IV+α-BGT group received treatment with As IV (20 mg·Kg−1·d−1, Cat No. SA8640, Solarbio). As IV was suspended in 1% carboxymethyl cellulose solution as a vehicle, and was given to rats through daily oral gavage from week 17 and continued for 6 weeks (Yang et al., 2013). Meanwhile, rats in the NF con group were given 1 ml of carboxymethyl cellulose. Furthermore, rats in the As IV+α-BGT group were continually treated with a daily intraperitoneal injection of the α7nAChR selective antagonist α-BGT (1 ug·Kg−1·d−1, Cat No. ab120542, Sigma) for 6 weeks (Li et al., 2012), and saline of an equal volume was administrated as a vehicle to the other three groups. All procedures were approved by the Faculty of Medicine and Health Sciences Ethics Committee for Animal Research of Affiliated Hospital of Shandong University of Traditional Chinese Medicine. Every effort was made to minimize pain to the animals. The daily average food intake was recorded, as was BP, heart rate (HR) and body weight from 7:00 am to 12:00 am, Wednesday to Friday every week. A tail cuff coupled to a photoelectric sensor was used to measure systolic BP (SBP), diastolic BP (DSP) and HR. Rats were put into the ALC-HTP system (ALCBIO, China), and then onto a 37°C delta phase heat pad to dilate the tail artery. Prior to measuring BP using the ALC-HTP system, all rats experienced adaptive training. When the rat was put in the ALC-HTP system, the tail cuff photo sensor was placed over the tail, and then a stable 15 min BP and pulse interval records without artifacts, or large sudden BP changes of each animal were used in the analysis. All rats were measured three times during the three days to obtain an average value. For the glucose tolerance tests (GTT) at the end of the experiment, all rats were fasted overnight and injected intra-peritoneally with glucose (0.5 g·Kg−1). Blood samples were taken from the tail vein, and glucose concentration was determined using a glucometer (Freestyle, Abbott Diabetes Care, USA) at 0, 30, 60 and 120 min after glucose injection. After 22 weeks, rats were anesthetized with sodium pentobarbital (40 mg/Kg, i. p.) and sacrificed for tissue collection. Blood was acquired from the abdominal aorta for further analysis. Blood levels of triglyceride (TG), total cholesterol (TC) and glucose were determined using an AU 5400 automated analyzer (Olympus, Japan). A craniotomy was performed where the brain was removed and incubated in cold-Hank’s solution for 3 min. The mediobasal hypothalamus, which contains the arcuate nucleus and ventromedial nucleus, was dissected as previously described in reference (Castellano et al., 2014). In brief, the mediobasal hypothalamus was dissected by two lateral cuts along the hypothalamic sulci, one posterior cut along the rostral border of the mammillary bodies, and one anterior cut immediately behind the optic chiasm. The thickness of each fragment was approximately 1–2 mm (White et al., 2009). After collection, the tissues were frozen in liquid nitrogen and stored at −85°C until RNA or protein extraction. The epididymal fat, retroperitoneal fat and perirenal fat were removed and weighed as a total fat weight. The ratio of fat weight to body weight was evaluated as the adiposity index. Epididymal fat was refrigerated at −85°C for further assay. Epididymal fat was fixed in 10% buffered formalin for 24 h and then embedded in paraffin. Tissue sections (5 μm) were cut and stained with hematoxylin and eosin (HE) and photographed at 100 × magnification. Using the image analysis software ZEN 1.01.0 (Carl Zeiss Microscopy GmbH, German), two fields per section and three sections per fat mass were analyzed to quantify the area and number of adipocytes. Plasma levels of leptin and insulin were determined with Elisa kits: leptin (Assay Biotech, Cat No. 10638R) and insulin (Crystal Chem, Cat No. 90010). The homeostasis model assessment (HOMA) of insulin sensitivity was calculated using the following formula: fasting glucose (mmol/L) × fasting insulin (μU/ml)/22.5 (Mathews et al., 2002). The contents of NE in the plasma and tissue homogenizer of the renal cortex, and levels of IL-1β and TNF-α in the epididymal adipose and blood were measured using the corresponding Elisa kits: norepinephrine (NE) (Assay Biotech, Cat No.10171R and Corporate R&D, Packaging Cat No. 10391RT), IL-1β (Abcam, Cat No. ab100767) and TNF-α (Abcam, Cat No. ab46070). Total RNA of mediobasal hypothalamic tissue samples and epididymal adipose tissue sample were extracted using the Trizol Reagent (Invitrogen, USA, Cat No. 15596-028) within 1 h. RNA content was assessed, and purity was determined as per A260/A280 ratios. A Prime Script RT reagent kit with gDNA Eraser was used (Takara BioInc, Japan, Lot No. RR047A) for reverse transcription of the first-strand complementary DNA as per the manufacturer’s instructions. Primers used are listed in Table 1. 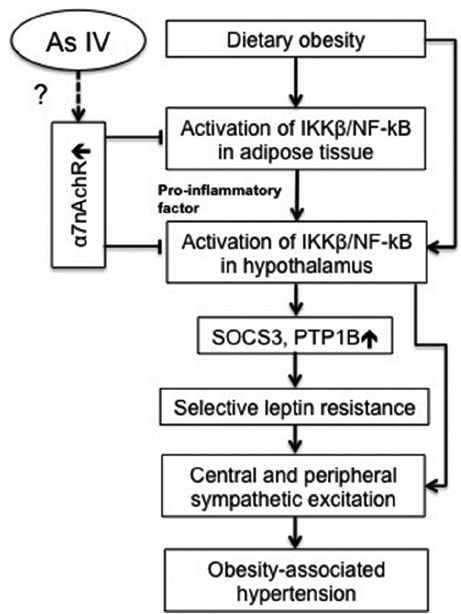 SOCS3, PTP1B, leptin receptor (LepRb), pro-opiomelanocortin (POMC) and neuropeptide (NPY) in the hypothalamic tissue and α7nAchR, IKKβ, NF-KB in the adipose tissue were determined. RT-qPCR was performed using the LightCycler 480 II RT-PCR system (Roche). The mRNA levels were normalized to GAPDH, which served as the internal control. The level of expression for each gene was calculated by the comparative threshold cycle value (Ct) method, using the formula 2-ΔΔCt (Where ΔΔCt=ΔCt sample-ΔCt reference) (Cheng et al., 2008). Every sample was performed in triplicate to confirm amplification specificity. For protein extraction, the frozen tissues were homogenized in a RIPA lysis buffer (Cat No. P0013B, Beyotime). The homogenate was incubated for 30 min at 4°C and centrifuged at 15000 g for 15 min at 4°C. The protein concentration of the supernatant was determined using a BCA Protein Assay Kit (Beyotime, China, Cat No. P0012S). Samples of 30 μg were run on 10% SDS-PAGE. The proteins were electro-transferred to PVDF membranes. The PVDF membranes were incubated with the primary antibody, and then incubated with corresponding secondary antibodies. The following antibodies were used: phosphorylated STAT3 (p-STAT3) (Cat No. ab76315, Abcam, 1:150000), phosphorylated phosphatidylinositol 3-kinase (p-PI3K) (Cat No. ab182651, Abcam, 1:500), α7nAchR (Cat No. ab10096, Abcam, 1:500), phosphorylated IKKβ (p-IKKβ) (Cat No. ab59195, Abcam, 1:1000), NF-KB p65 (Cat No. 1075-1-ap, Proteomes, 1:500), TNF-α (Cat No. ab6617, Abcam, 1:150), IL-6 (Cat No. sc-1265, Santa Cruz Biotechnology, 1:500) and β-actin (Cat No. ab6276, Abcam, 1:5000). The corresponding secondary antibody including Peroxidase-Conjugated Affinipure Goat Anti-Rabbit IgG (Cat No. ZB2305, Zsbio, 1:5000) and Peroxidase-Conjugated Affinipure Goat Anti-Mouse IgG (Cat No. ZB2301, Zsbio, 1:5000) were used. The bands corresponding to the proteins of interest were scanned and band density was analyzed by the FluorChem Q 3.4. (ProteinSimple, USA). All quantitative analyses were normalized to β-actin. Data were analyzed using the SPSS 22 statistical package (SPSS, USA). The normality of data distribution was evaluated using the Shapiro-Wilk test. Skewed distribution data were transformed by calculating their natural logarithm to approximate normal distribution. Paired-Samples Student’s tests were used to analyze differences before and after treatment in the same group, and one-way analysis of variance (ANOVA) followed by Dunnett’s test or the Student-Newman-Keuls (SNK) test were used to analyze the differences between the groups. A value of P < 0.05 was regarded as statistically significant, and values of P < 0.10 were considered as a trend. Values were expressed as mean ± SEM. After 16 weeks, the average body weight of rats in the HF con group was significantly higher than those in the NF con group (Fig. 2A, P < 0.01). In contrast, the As IV treatment significantly reduced body weight and daily average food intake compared with the HF con group (Fig. 2B) in weeks 4–6 (P < 0.01, P < 0.05). Moreover, these As IV effects were diminished when co-administrated with α-BGT. Next, to determine the effects of As IV on metabolic parameters, we measured glucose tolerance, HOMA-IR, and TC and TG levels to assess the effects of As IV on metabolism disorders (Figs. 2C–2F). Blood glucose levels at 30-, 60- and 120-min time points, HOMA-IR and blood levels of TC and TG in the HF con group were higher when compared with the NF con group (P < 0.01). Chronic As IV treatment improved glucose intolerance and HOMA-IR, and decreased TC and TG levels when compared with the HF con group (P < 0.01, P < 0.05, respectively). However, the co-administration of α-BGT reduced the effects of As IV, as evidenced by the increased blood glucose levels at 30-, 60- and 120-min time points and HOMA-IR when compared with As IV-treated rats (P < 0.01, P < 0.05, respectively). Consistent with the elevated body weight, the HFD increased visceral fat accumulation and the ratio of fat weight to body weight when compared with the NF con group (P < 0.01, Figs. 2G and 2H). As IV treatment significantly reversed the increased visceral fat deposition and ratio between the fat weight and body weight in rats on the HFD, while the effects of As IV were minimized by α-BGT (Figs. 2G, 2H, and 2K, P < 0.01). 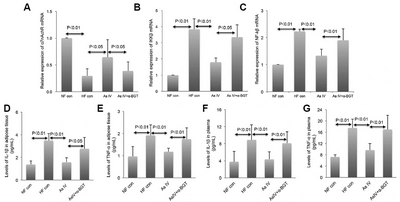 Additionally, HE staining of epididymal fat showed that rats in the As IV group possessed a smaller adipocyte size than the rats in the HF con group and As IV+α-BGT group (Fig. 2I, P < 0.01). After 16 weeks of a HFD, both BP and HR were significantly higher in the HF con group when compared with the normal fat diet rats throughout the 6-week recording period (P < 0.01, P < 0.05, respectively; Figs. 3A–3C). As expected, As IV gradually decreased SBP, DBP and HR in the As IV group compared to the HF con and As IV+α-BGT groups (P < 0.01, P < 0.05, respectively). At the end of the observation period, the SBP of rats in the HF con group increased by 4.3% (P < 0.05, Figs. 3D and 3E). In contrast, the values of SBP and DBP in the As IV group decreased by 14.5% (P < 0.01) and 5.7% (P < 0.05) than pre-treatment, respectively. To evaluate the peripheral sympathetic activity, we measured the contents of NE in the blood and renal tissue. As shown in Figs. 3F and 3G the HFD increased the contents of NE in both blood and renal tissue, while treatment with As IV reduced the contents of NE when compared with the HF con and As IV+α-BGT groups (P < 0.01, P < 0.05, respectively). In obese individuals, central leptin resistance results in elevated sympathetic excitation (da Silva et al., 2013; Matsumura et al., 2000; Mark et al., 1999). In our study, we observed the effects of As IV treatment on hypothalamic leptin resistance. When compared with the NF con group, rats in the HF con group displayed a significantly elevated serum leptin level and decreased LepRb mRAN expression (80.2% and −65.9%, respectively; P < 0.01, Figs. 4D and 4E). Meanwhile, expressions of leptin signaling molecular p-STAT3 decreased by −67.1%, while p-PI3K, SOCS3 mRNA and PTP1B mRNA increased by 128.8%, 216.7% and 215.7%, respectively (P < 0.01, Figs. 4A, 4B, 4C, 4F, and 4G). This indicates that leptin resistance occurred in the HF con group. As IV treatment reversed the leptin resistance reflected by the increased p-STAT3 (110.9%, P < 0.05) and LepRb mRNA (118.2%, P < 0.01), and reduced serum leptin level (−28.3%, P < 0.01); and expressions of p-PI3K, SOCS3 mRNA, and PTP1B mRNA (−38.5%, −60.6%, −61.4% respectively, P < 0.01) when compared with the HF con group. However, the effects of As IV on leptin resistance were diminished when co-administrated with α-BGT (P < 0.05). Leptin regulates expressions of appetite-associated peptides including pro-opiomelanocortin (POMC) and neuropeptide Y (NPY) by activating the JAK2/STAT3 pathway. In our study, the POMC mRNA levels were significantly increased in As IV-treated rats when compared with both the HF con group and the As IV+α-BGT group (P < 0.01, Fig. 4H). The NPY mRNA levels were not statistically altered by As IV treatment (Fig. 4I). To determine the mechanism by which As IV treatment potentially rescued leptin signaling in the hypothalamus, we assessed the impacts of As IV on local inflammation associated with leptin signaling disruption and the activity of the cholinergic anti-inflammatory pathway. Our results showed that HFD decreased the hypothalamic protein (−59.6%, P < 0.01, Figs. 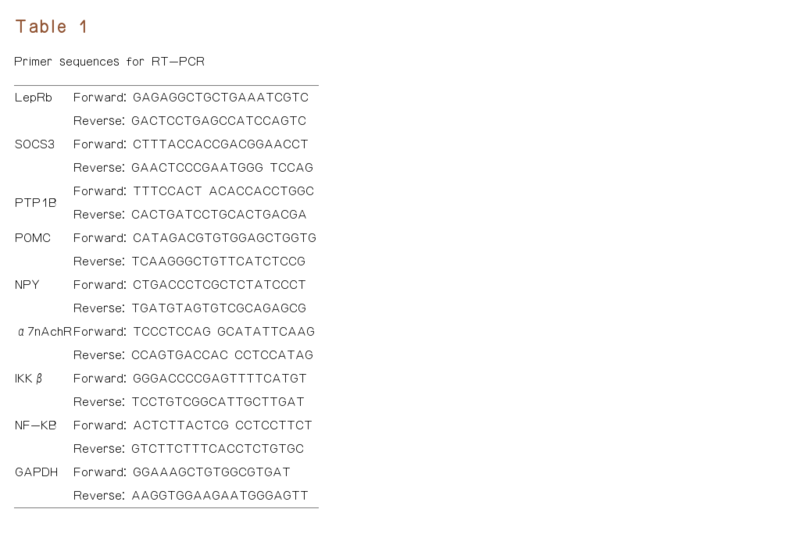 5A and 5B) and mRNA expressions of α7nAChR (−65%, P < 0.01, Fig. 5C), while elevated mRNA and protein expression of p-IKKβ (129% and 60.2%, P < 0.01) and NF-KB (213% and 86.2%, P < 0.01), and levels of IL-1β and TNF-α (51.9% and 119.4%, respectively, P < 0.05, Fig. 5D–5F) compared with the rats with the normal diet. Furthermore, chronic As IV treatment increased protein (106.5%, P < 0.01) and mRNA (129%, P < 0.05) expression of α7nAChR and inhibited the protein and mRNA expressions of p-IKKβ and NF-KB (P < 0.05, P < 0.01). Similarly, administration of As IV decreased the contents of IL-1β and TNF-α (−29.6% and −38.2% respectively, P < 0.01). 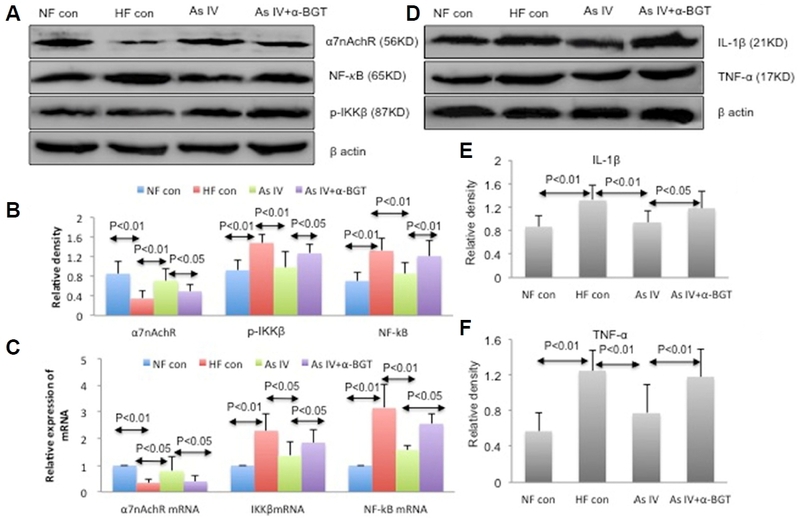 However, the effects of As IV were weakened by the α7nAChR blocker α-BGT, which showed the mRNA and protein levels of α7nAChR decreased, while IKKβ mRNA, NF-KB mRNA, p-IKKβ, NF-KB, IL-1β and TNF-α increased when compared with the As IV group (P < 0.01, P < 0.05, respectively). These results indicated that As IV could inhibit the hypothalamic inflammatory reaction by up-regulating expression of α7nAChR. We also examined whether As IV could attenuate peripheral inflammation by activating the α7nAChR pathway in HFD-induced obese rats. 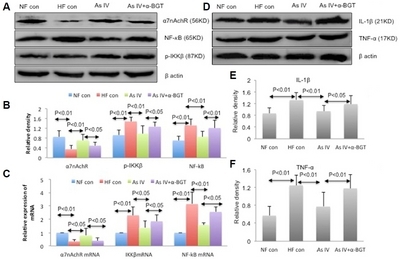 Consistent with the results of the hypothalamus, the expression of α7nAChR mRNA in the HF con group was reduced by 70% in comparison to the NF con group (P < 0.01, Fig. 6A), while p-IKKβ mRNA and NF-KB mRNA increased (283% and 123% respectively, P < 0.01, Figs. 6B and 6C). Additionally, the levels of IL-1β and TNF-α in blood and adipose tissue increased (P < 0.01, Figs. 6D–6G). As IV treatment increased α7nAChR mRNA expression and decreased expression of p-IKKβ and NF-KB, as well as IL-1β and TNF-α when compared with the HF con and As IV+α-BGT groups (P < 0.01, P < 0.05, respectively). It has been clearly demonstrated that obesity-associated hypertension is closely related to central and peripheral inflammation (Cai, 2013; 2009); however, effective pharmacological methods to mitigate obesity-associated inflammation are yet to be found. Most recently, several studies have demonstrated that some natural bioactive compounds such as As IV, proanthocyanidins and ginsenoside Rb 1 were potential therapeutic drugs for obesity and obesity-associated inflammation (Ibars et al., 2016; Wu et al., 2014; 2016; Yu et al., 2013). Based on these studies, we determined whether chronic administration of As IV (20 mg·Kg−1·d−1) as a natural bioactive compound could reverse obesity-associated hypertension. In our study, our results indicated that chronic treatment with As IV could suppress the central and peripheral inflammation reaction and improve leptin resistance, and thereby prevent the development of obesity-associated hypertension. These effects of As IV were partly related to the increased α7nAChR expression in the hypothalamus and adipose tissue. Our study demonstrated that As IV treatment reduced obesity and improved glucose and lipid metabolism parameters, which were consistent with results reported by Wu et al. (2016). However, all these effects were diminished when simultaneously administered with the α7nAchR antagonist α-BGT, indicating that these favorable effects of As IV were related to the activation of α7nAchR. Substantial evidence points to leptin resistance as a key link between obesity, sympathetic overdrive, and obesity-associated hypertension (Kusminski and Scherer, 2015). Generally, leptin binds to its receptor LepR in neuronal populations to activate the JAK2/STAT3 signaling pathway, and thereby suppresses appetite by stimulating the transcription of the anorectic neuropeptide POMC and inhibiting the transcription of the orexigenic NPY/agouti gene-related protein (AgRP) (Sainz et al., 2015). Simultaneously, leptin-induced POMC peptides (α,β, and γ melanocyte-stimulating hormones) act on melanocortin 4-receptor neurons, increasing sympathetic nerve outflow (Enriori et al., 2011). Unfortunately, in obesity, excessive leptin fails to effectively regulate appetite and energy expenditure, while maintaining its positive effects on stimulating sympathetic excitation, resulting in elevated HR and BP (Mark, 2013). Until now, despite the precise mechanisms being not completely understood, reduced LepRs expression and disrupted intracellular leptin transduction signaling in hypothalamic neurons has been recognized as the crucial underlying mechanisms that contribute to leptin resistance (Jung and Kim, 2013). Studies have recognized that different leptin signal transductions produce differential regulation of sympathetic metabolic versus sympathetic cardiovascular/renal function (Kusminski and Scherer, 2015). The STAT3 signaling is involved in sympathetically mediated metabolic activity while it does not influence renal sympathetic activity (Harlan et al., 2013). Reduction of leptin-induced STAT3 phosphorylation in the hypothalamic neurons has been considered as a leading marker for cellular leptin signal attenuations in HFD-induced obese rats (Levin et al., 2004). In contrast to STAT3 signaling, the activated PI3K signaling pathway in hypothalamic neurons is crucial for leptin-induced renal sympathetic activity and elevated BP, while playing a minor role in mediating the effects of leptin on energy balance (do Carmo et al., 2014; Rahmouni et al., 2003). Accordingly, in obesity, the suppressed STAT3 signal transduction and elevated PI3K signal transduction in hypothalamic neurons is one of the most important mechanisms of hypothalamic leptin resistance, leading to both metabolic dysfunction and sympathetically mediated hypertension. In our study, HFD-induced obesity increased serum levels of leptin while decreased hypothalamic LepRb mRNA expression; meanwhile, expressions of p-STAT3 decreased while p-PI3K relatively increased in hypothalamus tissue, indicating leptin resistance occurred in the obese rats. Consistently, these rats had relatively higher BP and HR, as well as increased contents of NE in blood and renal tissue. Remarkably, chronic As IV treatment improved the leptin signaling pathway, as evidenced by the upregulated expressions of LepR and p-STAT3, and downregulated p-PI3K expression in the hypothalamic neurons. These results were consistent with a previous study, which reported that As IV improved central leptin sensitivity in obese mice by up-regulating the expression of hypothalamic LepR mRNA and p-STAT3 (Wu et al., 2016). Leptin signaling promotes the expression of anorexigenic POMC and inhibits orexigenic NPY/AgRP expression by activating the JAK2/PI3K pathway, and then inhibits food intake. Leptin-induced activation of POMC-melanocortin system (Leptin activates the JAK2/STAT3 pathway, promoting the production of POMC peptides, which activate the melanocortin receptor and mediate peripheral sympathetic outflow) is the main pathological mechanism of obesity-associated hypertension (Greenfield et al., 2009; Humphreys et al., 2011). Surprisingly, we found that POMC mRNA expression in the obesity-induced hypertension rats decreased, while treatment with As IV elevated the expression of POMC without an increase in BP. This phenomenon caused by As IV seems contrary to the previous conclusions reached in Reference (Simonds et al., 2014). These contradictory results may be explained by studies performed by Enriori et al. (2011), which showed that leptin’s effect on BP was independent of the POMC-melanocortin circuits as the POMC neurons become unresponsive to leptin in obesity. 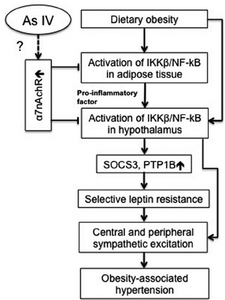 Chronic obesgenic condition resulted in activation of IKKβ/NF-KB pathway in peripheral adipose tissue and hypothalamus, which is one of the most important underlying mechanisms that lead to leptin resistance (Cai, 2013). In our study, we found that HFD-induced obesity increased the expressions of p-IKKβ, NF-KB and proinflammatory factors in both the hypothalamus and adipose tissue, which resulted in the overexpression of SOCS3 and PTP1B in the hypothalamus. According to the definition of cholinergic anti-inflammatory pathway, the stimulated α7nAchR could inhibit inflammation reaction by suppressing activation of IKKβ/NF-KB pathway in central and peripheral tissue (Tracey, 2009). Thus, we deduced that up-regulating or activating α7nAchR in central and peripheral tissue could be an effective way to block leptin resistance by inhibiting inflammatory reaction. Our results demonstrated this hypothesis, and it indicated that HFD-induced obesity decreased the expression of α7nAchR in both hypothalamic and adipose tissue, while chronic oral administration of As IV could up-regulate α7nAchR expression and inhibit the activation of IKKβ/NF-KB pathway in both hypothalamic and adipose tissue. The diminished hypothalamic inflammation prevents development of hypothalamic leptin resistance by decreasing generation of SOCS3 and PTP1B. 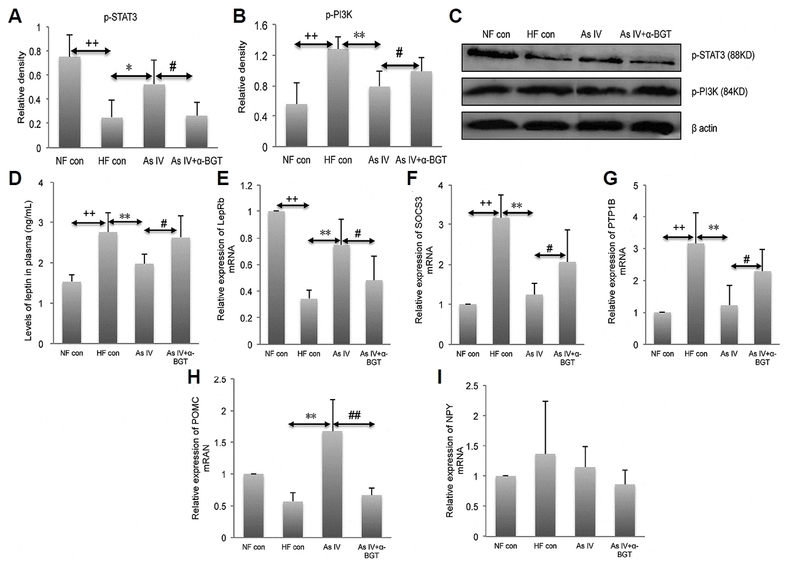 Additionally, previous study has shown that in the development of obesity-associated hypertension, the activated hypothalamic IKKβ/NF-KB pathway could lead to central sympahthetic excitation through several direct or indirect pathways (Rahmouni et al., 2011), and leptin resistance mediated by activation of IKKβ/NF-KB pathway might be one of these pathways. Therefore, as shown in Fig. 1, inhibiting the hypothalamic activation of IKKβ/NF-KB pathway by targeting α7nAchR is the key pathway that preventing the development of obesity-associated hypertension, and we thought that these is the key mechanism of As IV on preventing obesity-associated hypertension. Although the molecular mechanism of this phenomenon has not been explored in the present study, we deduced it might be relate to the modulation of cholinergic nervous system. There were limitations in our study. Firstly, we did not perform central injection of As IV to demonstrate the direct action of As IV in hypothalamic. However, according to our results, we could not exclude the central anti-inflammatory effect of As IV. It has been reported that As IV is able to pass through blood-brain barrier in rodents when administrated peripherally (Wu et al., 2016). In the models of ischemia/ reperfusion or anesthetics induced brain injury, it has demonstrated that peripheral administration of As IV could inhibit activation of IKKβ/NF-kB pathway (Li et al., 2012; Sun et al., 2016), which is the crucial and direct molecular mechanism that contributes to obesity-induced hypertension (Rahmouni et al., 2011). Additionally, study has demonstrated peripheral administration of As IV could enhance hypothalamic expression of leptin receptors in HFD-induced obese rats, and in vitro, As IV could directly activate leptin receptors/STAT3 signaling transduction in neuronal cell line SH-SY5Y (Wu et al., 2016). All these data might supports the hypothesis that As IV possesses a central action to combat hypothalamic inflammation and leptin resistance. Secondly, our study implicated the involvement of α7nAchR, it did not excluded the effects of As IV on alternative pathways which perhaps coupled or acting in parallel to α7nAchR. Thirdly, in addition to leptin resistance and systemic inflammatory reaction, studies have reported that there are many mechanisms that contribute to the pathophysiology of obesity-associated hypertension, such as activation of renin-angiotensin-aldosterone system, endothelial and vascular dysfunction, sodium retension, glomerular hyperfiltration and central leptin-melanocortin axis dysfunction (DeMarco et al., 2014; Hall et al., 2015). Until now, whether As IV could prevent obesity-associated hypertension by acting on these mechanisms has not been explored. In the present study, our results only showed that As IV could prevent obesity-associated hypertension by inhibiting inflammatory reaction and improving leptin resistance, and we did not explore the impacts of As IV on the other pathways. Our future study will illustrate these problems. In our present study, we have demonstrated that chronic As IV treatment could decrease obesity-associated hypertension by improving low-grade inflammatory reaction and leptin resistance, which is partly attributed to the upregulated expression of α7nAchR in hypothalamus and adipose tissue. Our study provides a novel role for As IV as an anti-hypertensive agent in obesity-associated hypertension. Mol. Cells.Mar 31, 2018; 41(3): 244-255. Received August 1, 2017; Accepted December 18, 2017. Cai, D (2009). NFkappaB-mediated metabolic inflammation in peripheral tissues versus central nervous system. Cell Cycle. 8, 2542-2548. Cai, D (2013). Neuroinflammation in overnutrition-induced diseases. Vitam Horm. 91, 195-218. Cai, D, and Liu, T (2011). Hypothalamic inflammation: a double-edged sword to nutritional diseases. Ann N Y Acad Sci. 1243, E1-39. Castellano, JM, Wright, H, Ojeda, SR, and Lomniczi, A (2014). An alternative transcription start site yields estrogen-unresponsive Kiss1 mRNA transcripts in the hypothalamus of prepubertal female rats. Neuroendocrinology. 99, 94-107. Chen, NZQ, Du, Y, Chen, GG, and Zhu, LL (2006). Pharmacokinetics and tissue distribution of astragaloside IV in rats. Chin J Bioproc E. 4, 67-72. Cheng, A, Johnson, CL, and Ford, LP (2008). A step-by-step procedure to analyze the efficacy of siRNA using real-time PCR. Methods Mol Biol. 419, 303-316. Chobanian, AV (2009). Shattuck Lecture. The hypertension paradox--more uncontrolled disease despite improved therapy. N Engl J Med. 361, 878-887.
da Silva, AA, do Carmo, JM, and Hall, JE (2013). Role of leptin and central nervous system melanocortins in obesity hypertension. Curr Opin Nephrol Hypertens. 22, 135-140.
de Git, KC, and Adan, RA (2015). Leptin resistance in diet-induced obesity: the role of hypothalamic inflammation. Obes Rev. 16, 207-224. DeMarco, VG, Aroor, AR, and Sowers, JR (2014). The pathophysiology of hypertension in patients with obesity. Nature reviews. Endocrinology. 10, 364-376.
do Carmo, JM, da Silva, AA, Ebaady, SE, Sessums, PO, Abraham, RS, Elmquist, JK, Lowell, BB, and Hall, JE (2014). Shp2 signaling in POMC neurons is important for leptin’s actions on blood pressure, energy balance, and glucose regulation. Am J Physiol Regul Integr Comp Physiol. 307, R1438-1447. Enriori, PJ, Sinnayah, P, Simonds, SE, Garcia Rudaz, C, and Cowley, MA (2011). Leptin action in the dorsomedial hypothalamus increases sympathetic tone to brown adipose tissue in spite of systemic leptin resistance. J Neurosci. 31, 12189-12197. Filozof, C, Fernandez Pinilla, MC, and Fernandez-Cruz, A (2004). Smoking cessation and weight gain. Obes Rev. 5, 95-103. Greenfield, JR, Miller, JW, Keogh, JM, Henning, E, Satterwhite, JH, Cameron, GS, Astruc, B, Mayer, JP, Brage, S, and See, TC (2009). Modulation of blood pressure by central melanocortinergic pathways. N Engl J Med. 360, 44-52. Hall, JE, do Carmo, JM, da Silva, AA, Wang, Z, and Hall, ME (2015). Obesity-induced hypertension: interaction of neurohumoral and renal mechanisms. Circ Res. 116, 991-1006. Harlan, SM, Guo, DF, Morgan, DA, Fernandes-Santos, C, and Rahmouni, K (2013). Hypothalamic mTORC1 signaling controls sympathetic nerve activity and arterial pressure and mediates leptin effects. Cell Metab. 17, 599-606. Huang, H, Xu, Y, and van den Pol, AN (2011). Nicotine excites hypothalamic arcuate anorexigenic proopiomelanocortin neurons and orexigenic neuropeptide Y neurons: similarities and differences. J Neurophysiol. 106, 1191-1202. Hughes, K, Leong, WP, Sothy, SP, Lun, KC, and Yeo, PP (1993). Relationships between cigarette smoking, blood pressure and serum lipids in the Singapore general population. Int J Epidemiol. 22, 637-643. Humphreys, MH, Ni, XP, and Pearce, D (2011). Cardiovascular effects of melanocortins. Eur J Pharmacol. 660, 43-52. Hur, YN, Hong, GH, Choi, SH, Shin, KH, and Chun, BG (2010). High fat diet altered the mechanism of energy homeostasis induced by nicotine and withdrawal in C57BL/6J mice. Mol Cell. 30, 219-226. Ibars, M, Ardid-Ruiz, A, Suarez, M, Muguerza, B, Blade, C, and Aragones, G (2016). 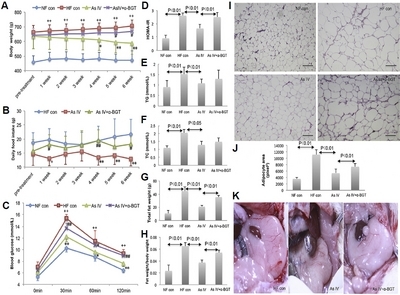 Proanthocyanidins potentiate hypothalamic leptin/STAT3 signalling and Pomc gene expression in rats with diet-induced obesity. Int J Obes. 41, 129-136. Jordan, J, Engeli, S, Boschmann, M, Weidinger, G, Luft, FC, Sharma, AM, and Kreuzberg, U (2005). Hemodynamic and metabolic responses to valsartan and atenolol in obese hypertensive patients. J Hypertens. 23, 2313-2318. Jung, CH, and Kim, MS (2013). Molecular mechanisms of central leptin resistance in obesity. Arch Pharm Res. 36, 201-207. Kusminski, CM, and Scherer, PE (2015). Leptin beyond the lipostat: key component of blood pressure regulation. Circ Res. 116, 1293-1295. Levin, BE, Dunn-Meynell, AA, and Banks, WA (2004). Obesityprone rats have normal blood-brain barrier transport but defective central leptin signaling before obesity onset. Am J Physiol Regul Integr Comp Physiol. 286, R143-150. Li, H, Zhang, ZZ, Zhan, J, He, XH, Song, XM, and Wang, YL (2012). Protective effect of PNU-120596, a selective alpha7 nicotinic acetylcholine receptor-positive allosteric modulator, on myocardial ischemia-reperfusion injury in rats. J Cardiovasc Pharmacol. 59, 507-513. Li, M, Qu, YZ, Zhao, ZW, Wu, SX, Liu, YY, Wei, XY, Gao, L, and Gao, GD (2012). Astragaloside IV protects against focal cerebral ischemia/reperfusion injury correlating to suppression of neutrophils adhesion-related molecules. Neurochem Int. 60, 458-465. Mark, AL (2008). Dietary therapy for obesity: an emperor with no clothes. Hypertension. 51, 1426-1434. Mark, AL (2013). Selective leptin resistance revisited. Am J Physiol Regul Integr Comp Physiol. 305, R566-581. Mark, AL, Shaffer, RA, Correia, ML, Morgan, DA, Sigmund, CD, and Haynes, WG (1999). Contrasting blood pressure effects of obesity in leptin-deficient ob/ob mice and agouti yellow obese mice. J Hypertens. 17, 1949-1953. Martinez de Morentin, PB, Whittle, AJ, Ferno, J, Nogueiras, R, Dieguez, C, Vidal-Puig, A, and López, M (2012). Nicotine induces negative energy balance through hypothalamic AMP-activated protein kinase. Diabetes. 61, 807-817. Mathews, ST, Singh, GP, Ranalletta, M, Cintron, VJ, Qiang, X, Goustin, AS, Jen, KL, Charron, MJ, Jahnen-Dechent, W, and Grunberger, G (2002). Improved insulin sensitivity and resistance to weight gain in mice null for the Ahsg gene. Diabetes. 51, 2450-2458. Matsumura, K, Abe, I, Tsuchihashi, T, and Fujishima, M (2000). Central effects of leptin on cardiovascular and neurohormonal responses in conscious rabbits. Am J Physiol Regul Integr Comp Physiol. 278, R1314-1320. Movafeghi, A, Djozan, D, Razeghi, JA, and Baheri, T (2010). Identification of volatile organic compounds in leaves, roots and gum of Astragalus compactus Lam. using solid phase microextraction followed by GC-MS analysis. Nat Prod Res. 24, 703-709. Purkayastha, S, Zhang, G, and Cai, D (2011). Uncoupling the mechanisms of obesity and hypertension by targeting hypothalamic IKK-beta and NF-kappaB. Nat Med. 17, 883-887. Rahmouni, K, Haynes, WG, Morgan, DA, and Mark, AL (2003). Intracellular mechanisms involved in leptin regulation of sympathetic outflow. Hypertension. 41, 763-767. Rahmouni, K, Davisson, RL, and Sigmund, CD (2011). Inflaming hypothalamic neurons raises blood pressure. Cell Metab. 14, 3-4. Sainz, N, Gonzalez-Navarro, CJ, Martinez, JA, and Moreno-Aliaga, MJ (2015). Leptin signaling as a therapeutic target of obesity. Expert Opin Ther Targets. 19, 893-909. Simonds, SE, Pryor, JT, Ravussin, E, Greenway, FL, Dileone, R, and Allen, AM (2014). Leptin mediates the increase in blood pressure associated with obesity. Cell. 159, 1404-1416. Sun, J, Chen, XL, Zheng, JY, Zhou, JW, and Ma, ZL (2016). Astragaloside IV protects new born rats from anesthesia-induced apoptosis in the developing brain. Exp Ther Med. 12, 1829-1835. Tracey, KJ (2009). Reflex control of immunity. Nat Rev Immunol. 9, 418-428. Valdearcos, M, Xu, AW, and Koliwad, SK (2015). Hypothalamic inflammation in the control of metabolic function. Annu Rev Physiol. 77, 131-160. Wang, X, Yang, Z, Xue, B, and Shi, H (2011). Activation of the cholinergic antiinflammatory pathway ameliorates obesity-induced inflammation and insulin resistance. Endocrinology. 152, 836-846. Wang, X, Ge, A, Cheng, M, Guo, F, Zhao, M, and Zhou, X (2012). Increased hypothalamic inflammation associated with the susceptibility to obesity in rats exposed to high-fat diet. Exp Diabetes Res. 2012, 847246. White, CL, Whittington, A, Barnes, MJ, Wang, Z, Bray, GA, and Morrison, CD (2009). HF diets increase hypothalamic PTP1B and induce leptin resistance through both leptin-dependent and - independent mechanisms. Am J Physiol Endocrinol Metab. 296, E291-299. Winklewski, PJ, Radkowski, M, Wszedybyl-Winklewska, M, and Demkow, U (2015). Brain inflammation and hypertension: the chicken or the egg?. J Neuroinflammation. 12, 85. Wu, Y, Yu, Y, Szabo, A, Han, M, and Huang, XF (2014). Central inflammation and leptin resistance are attenuated by ginsenoside Rb1 treatment in obese mice fed a high-fat diet. PLoS One. 9, e92618. Wu, H, Gao, Y, Shi, HL, Qin, LY, Huang, F, Lan, YY, Zhang, BB, Hu, ZB, and Wu, XJ (2016). 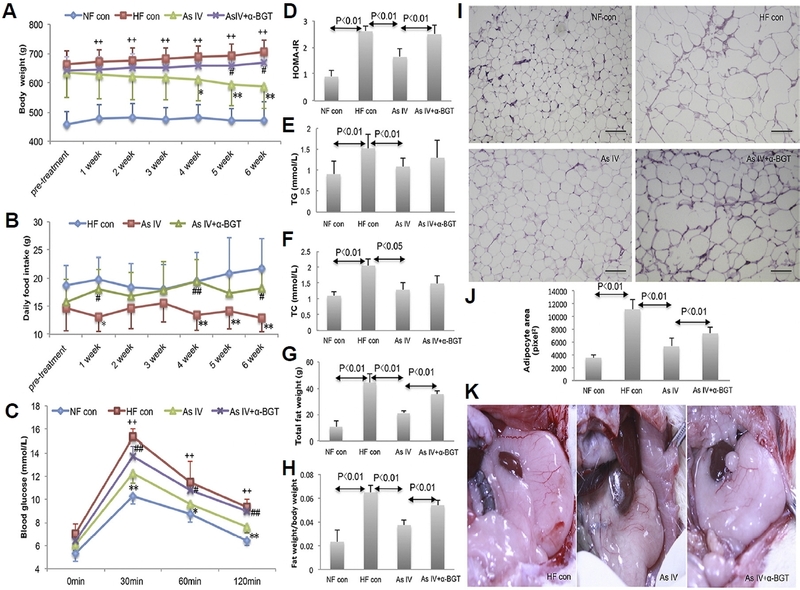 Astragaloside IV improves lipid metabolism in obese mice by alleviation of leptin resistance and regulation of thermogenic network. Sci Rep. 6, 30190. Yang, J, Wang, HX, Zhang, YJ, Yang, YH, Lu, ML, Zhang, J, Li, ST, Zhang, SP, and Li, G (2013). Astragaloside IV attenuates inflammatory cytokines by inhibiting TLR4/NF-small ka, CyrillicB signaling pathway in isoproterenol-induced myocardial hypertrophy. J Ethnopharmacol. 150, 1062-1070. Yu, Y, Wu, Y, Szabo, A, Wu, Z, Wang, H, Li, D, and Huang, XF (2013). Teasaponin reduces inflammation and central leptin resistance in diet-induced obese male mice. Endocrinology. 154, 3130-3140. Zhang, X, Zhang, G, Zhang, H, Karin, M, Bai, H, and Cai, D (2008). Hypothalamic IKKbeta/NF-kappaB and ER stress link overnutrition to energy imbalance and obesity. Cell. 135, 61-73. Zhang, N, Wang, XH, Mao, SL, and Zhao, F (2011). Astragaloside IV improves metabolic syndrome and endothelium dysfunction in fructose-fed rats. Molecules. 16, 3896-3907.